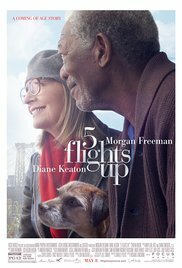 “5 Flights up” is an easy-going film about an old married couple (Alex and Ruth) who came to the conclusion that after living in that part of Brooklyn for about 40 years, where they bought a cozy apartment, the time came to leave all this behind and find another place to live. For all sorts of reasons. First, the neighborhood is no longer as it was before and is engulfed by a younger generation. And also the lack of a lift became a daily obstacle for the house owner and their old dog. Eventually, they decide to sell their apartment and they leave this in the hands of a niece who knows the tricks in this business. And before they realize it, their apartment is occupied by potential buyers who can be divided into several categories: candidates who are determined to seize this unique opportunity with both hands, the yuppies who want to redesign the entire floor, the real estate tourists who just come their to watch television and eat some snacks and even someone who’s always trying out the bed. Alex doesn’t feel at home anymore, despite it’s still his own apartment and it’s not even sold yet. For the two protagonists alone, I necessarily wanted to see this movie. Not that I’m a big fan of Diana Keaton, who usually plays a corny, traditional mother in some romantic comedy where someone is getting married once again (a film such as “The Big Wedding“). Although I could appreciate her performance in “The Family Stone“, even though she played again the mother hen. But “5 Flights up” was perfect for her. A serene and formal older woman who even in the most hectic and stressful situations, remains calm. She’s hardened by the past when she made the decision to marry an Afro-American. Compared to that every setback is just peanuts. I was particularly curious about how Morgan Freeman would play his part. After a succession of meaningless roles in both brilliant films as soon-to-be-forgotten films, like “Olympus Has Fallen“, “Oblivion“, “Now you see me“, “Last Vegas“, “Transcendence“, “Lucy” and “Last Knights“, it was once again time for this brilliant actor to being featured in an entire movie. And he lived up to my expectations. Flawlessly he acquitted himself of his task : the spouse who’s still in love with his wife after all these years, the cheerful artist who rather withdraws into his studio while strangers are wandering through his flat, the worried owner of a pet that needs medical assistance (no matter what it costs) and the resolute decision maker who ultimately decides about what’s rightfully his. Formidable performance. Only the script is kind of dull to keep things interesting. Admittedly, the situations arising from the sale are frequently humorous and engaging. But a whole film just about selling an apartment with on the one hand the financial advantage and on the other hand a pile of memories that needs to be left behind, is still only limited material to work with. The message that this film conveys is that money can’t replace nostalgic musings and feelings. A sunrise is nowhere the same and you’ll have to forget certain habits and situations from the past. It’s beautifully imaged with flashbacks that don’t seem to be disturbing, with a touch of melancholy and sadness on top. A smile and a tear. But just as in real life, selling a house isn’t particularly exciting and entertaining. That was for me the only downside of it all. But Freeman starring back again like this after a long time, made it bearable. Love to read your blog. thanks! Thanks to share these informative stuff. I am travel lover and always travel blogging.. happy to see you here. Thanks! I love to read your post evrytime, thanks a lot. Thanks for those kind words !